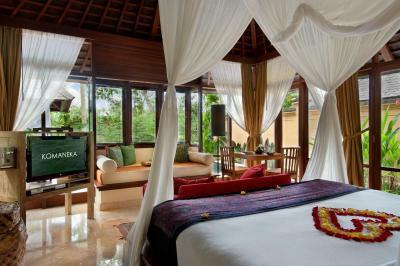 Lock in a great price for Komaneka at Tanggayuda Ubud – rated 9.5 by recent guests! This property is beautiful. We stayed in a villa with pool and had a view of the forest. Woke up to delicious breakfast in our gazebo and the sounds of the forest. Staff is professional and sweet and treated us like family. 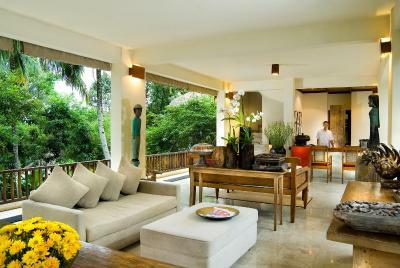 If you don’t mind being outside of walking range to Ubud and want privacy and perfect hospitality, this is it. Book drivers and plan trips from the hotel in advance. The staff was extremely friendly and helpful. The hospitality was beyond great. The room services was satisfactory. I am very satisfied with the food (breakfast, lunch and dinner) in the restaurant. Even before getting there and seeing it with my own eyes I knew that the Komaneka of Bali would be a magical place, but it surely exceeded all of my expectations, which were already very high. Everything, from the food, to the staff, to the location, to the spa was impeccable. 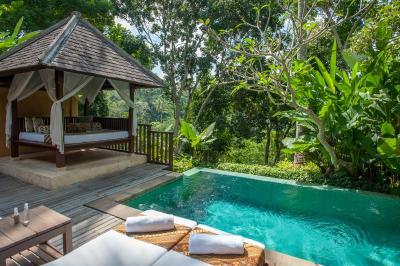 The place is in the middle of a rich forest, surrounded by green and tropical vegetation, near Ubud where you can find many interesting local and cultural places to visit. Their pool is breathtaking and their spa is unique with the most skilled therapists. You can really call this place a little piece of heaven on earth where you’ll feel regenerated and full of energy. Highly reccomended if you’re looking for piece and tranquility in a unique location with the best service. I hope I’ll be able to go back soon. Attention to detail was amazing. They had thought of everything we could possibly need. Amazing service, amazing food, very flexible and all the staff have a great smile when serving us. Very nice and quiet. I really enjoyed my stay. I felt spoiled during my time and it was some solitude that I needed. My villa had a tub, pool, and cabana but there are also the three main pools you can enjoy as well. Has a nice jungle village vibe. Staff was attentive, helpful, courteous and very helpful. The facilities are amazing and are great value for money. Staffs are very nice and service mind, The beautiful scenery of hotel, Feel fresh among natural. The accommodations were spectacular! Eating breakfast in our private gazebo next to our private pool was a wonderful way to start the day! The service was superb. The property was well landscaped and beautifullly kept. Food was delicious. I was sad to leave. Komaneka at Tanggayuda Ubud This rating is a reflection of how the property compares to the industry standard when it comes to price, facilities and services available. It's based on a self-evaluation by the property. Use this rating to help choose your stay! One of our best sellers in Ubud! 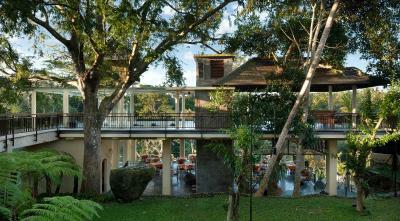 Komaneka at Tanggayuda enjoys a beautiful setting overlooking the Oos River. 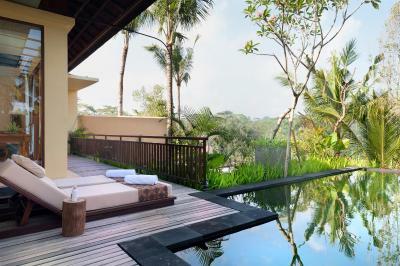 Aside from its outdoor infinity pool, it also provides free yoga, traditional Balinese dance and wood carving lessons. Guests enjoy free WiFi in all areas and free parking on site. 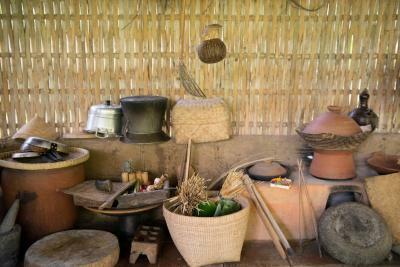 Komaneka Tanggayuda has a free shuttle service to popular Ubud, a 15-minute drive from the resort. There, guests may find craft shops, original art and restaurants. 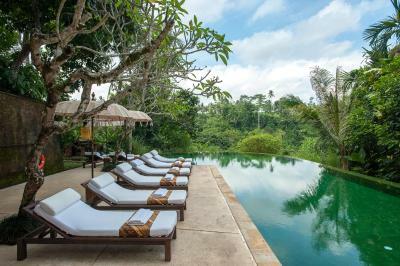 Ubud Palace is 3.1 mi from the accommodations, while Ubud Monkey Forest is 3.7 mi from the property. 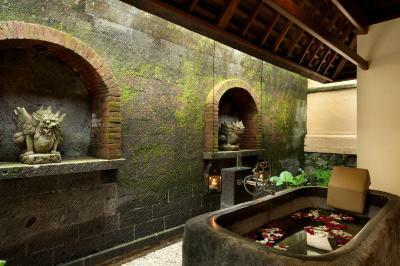 The nearest airport is Ngurah Rai International Airport, 21 mi from Komaneka at Tanggayuda Ubud. Boasting plenty of space, the air-conditioned rooms at Tanggayuda Komaneka features a bathtub and an elegant four-poster bed. Each room also comes with a cable/satellite TV, DVD player and mini-bar. 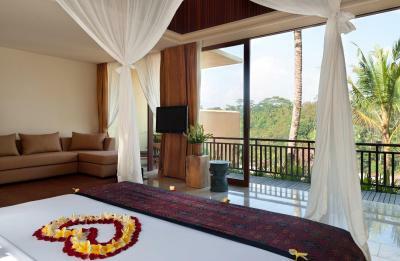 After enjoying a refreshing workout at the gym, guests may visit the spa for a relaxing massage to sooth tired muscles. The comfortable library provides a peaceful setting to read books or simply enjoy the garden views. Komaneka at Tanggayuda's restaurant serves a daily breakfast, as well as Indonesian dishes. Evening drinks and cocktails are available at the bar. 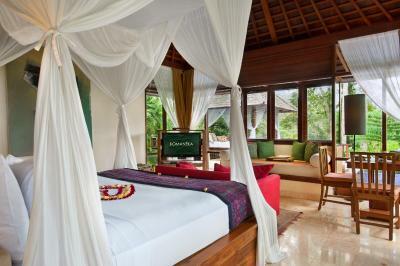 When would you like to stay at Komaneka at Tanggayuda Ubud? 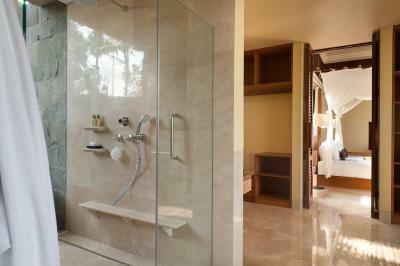 Suite features a 4-poster bed and private bathroom with a sunken marble bathtub. The 80-sqm suite is fitted with air conditioning, a flat-screen TV and a safety deposit box. Slippers, bathrobes and free toiletries are provided. 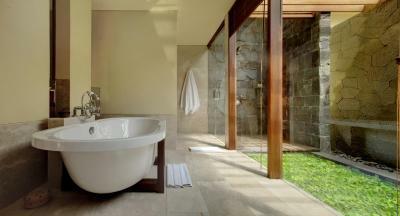 Overlooking a spectacular river valley, this luxurious villa features a 1.5-yard deep plunge pool. It is fitted with air conditioning, a flat-screen TV and a safety deposit box. 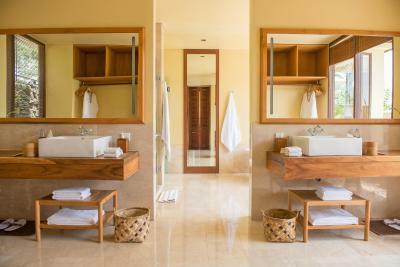 Private bathroom is stocked with slippers, bathrobes and free toiletries. Featuring a private pool, this villa has a private terrace overlooking the river valley. 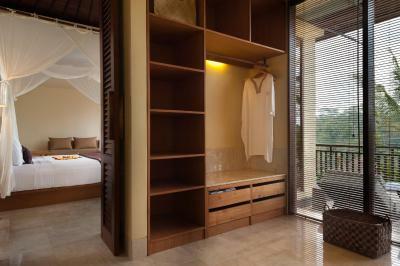 A personal safe, fridge and a flat-screen satellite TV with DVD player are available in the air-conditioned bedroom. 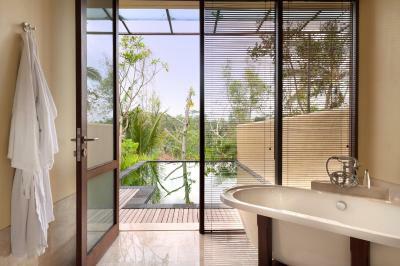 Private bathroom offers a bathtub and an outdoor rain shower. 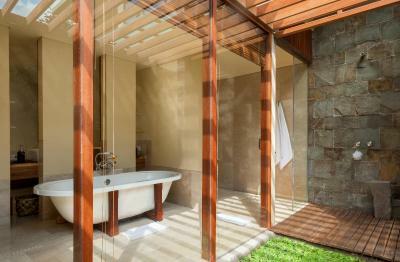 This villa features a 4-poster bed and a private bathroom with a sunken marble bathtub. It is fitted with air conditioning, a flat-screen TV and a safety deposit box. Slippers, bathrobes and free toiletries are provided. Featuring a plunge pool, this villa is fitted with air conditioning, a flat-screen TV and a safety deposit box. Slippers, bathrobes and free toiletries are provided. Featuring a private pool, this villa is fitted with air conditioning, a flat-screen TV and a safety deposit box. Slippers, bathrobes and free toiletries are provided. 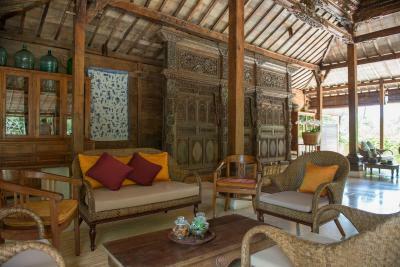 House Rules Komaneka at Tanggayuda Ubud takes special requests – add in the next step! 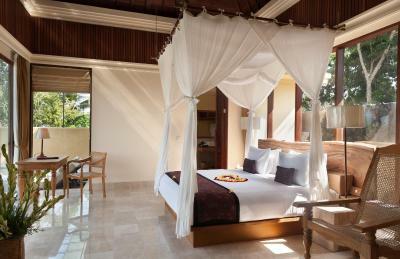 One child from 6 to 11 years is charged IDR 500000 per person per night in an extra bed. Komaneka at Tanggayuda Ubud accepts these cards and reserves the right to temporarily hold an amount prior to arrival. Please inform Komaneka at Tanggayuda Ubud of your expected arrival time in advance. You can use the Special Requests box when booking, or contact the property directly using the contact details in your confirmation. Variety of breakfast and dinner could be better although everything we had was top notch. the private pool was cold as their was no heating. the location of the hotel is far from the town, but very relaxing. their was some insects in the villa, but this is expected due to the location of the hotel. 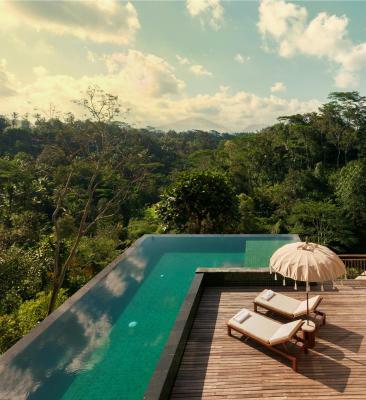 A great escape in the middle of the jungle. the villa is very comfortable and good. staff as helpful and the shuttle service to the village is great. Very few facilities in the room were a bit wear off. Like the outdoor shower knob. But the overall condition and quality gave me a great impression. Our roof was leaking a bit, which was not disruptive but it was slightly unpleasant as black dots progressively appeared on the white canopy. We loved our spacious room and the hotel’s location in the jungle just outside Ubud. The shuttle bus made getting into town easy. The hotel drivers were excellent and very polite whilst also being discreet. Altogether the hotel staff were incredibly helpful and accommodating. We would come back and recommend to others. The breakfast can be improved by making the breakfast an open buffet. However, by all means, the food was perfect and was of a great variety and great taste. The staff was so welcoming and helpful. We had a free upgrade of our villa, when they knew we were on a honeymoon. Overall the place was great, and the housekeeping was perfect. They would clean the place every single time we left the villa, and will refill the water, and other amenities. Very noisy footsteps from first floor makes me hard to sleep well. The hot water are not consistent and found cockroach in our room. Very nice room and toilet. Good place to relax. I really have a good time showering outside the room using a bamboo pipe and having breakfast in the room. The staff are friendly and very good. The only negative was the location being a min 30min shuttle ride out of Ubud (with it taking up to 1.5-2hrs in peak holiday times). However, you just wouldn't be able to get those views, setting or privacy being any closer to town so it's worth it. Komaneka was just divine. From the moment we were greeted to the beautiful way the staff waved us goodbye. The staff are all very accomodating and friendly. 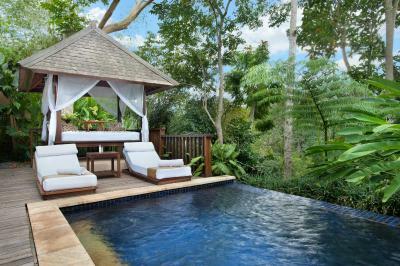 The setting is spectacular - all of the villas feeling like they are nestled in the jungle and completely private. Our pool villa was perfect. A great size and open plan layout with an enormous bathroom and it all opens out onto the pool and day bed. Eating breakfast that was delivered to your room on your day bed was a great way to start the day. The other 3 main pools were all just as incredible in their setting and size. 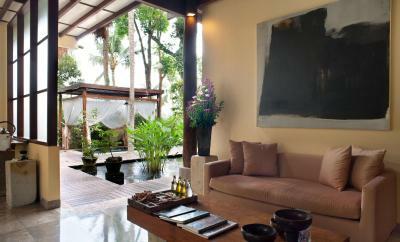 Location is a bit far from Ubud city center, and only 1 stop in city center. However, if you are looking for a calm and relax vacation or spend time with family, Komaneka at Tanggayuda is the perfect choice. 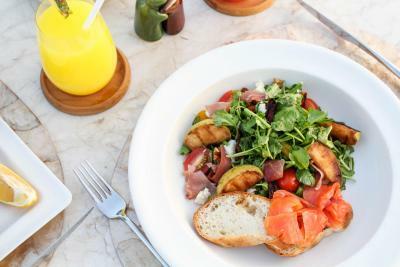 During our 2-night stay, the food served in the resort is far beyond our expectation! the Balinese tea time dessert is really yummy, the breakfast is gorgeous, and the dinner is absolutely delicious. There are many facilities in the resort, private & public pools (even warm water pool! ), gym, spa, and yoga class... We spent 2 complete days only in the resort, relaxed and not bored. The WiFi was extremely poor. The room size was very good but the property is quite old. The new year dinner and entertainment was not worth the money. The staff was courteous. They had apple TV in the room.